This is a delicious side dish I made this week that goes with just about anything. We had it along these delicious pork chops and my husband and toddler loved it! The natural sweetness from the carrots and sweet potatoes make this feel like an indulgence! I think it would also taste great with roasted chicken. This is a great healthy option for thanksgiving. It is creamy and sweet without any added sugar or dairy. It also makes a big batch and is great for feeding a crowd over the holidays. It has the best cheer-y,orange color, which I just love this time of year! Heat the oil in a heavy-bottomed saucepan over medium heat. Add the onion and cook until softened, about 6-7 minutes. Add the sweet potatoes, carrots, thyme, and bay leaves. Add the chicken stock and bring to boil. Reduce to a simmer and cover. Cook for 15-20 minutes, until vegetables are soft. Remove the bay leaves. Mash the mixture using a hand masher. For a smoother consistency, blend in a food processor until smooth. You will probably have to do this in 2 batches. Season to taste with salt and pepper. Enjoy! Do you have any alternate suggestions to use in place of chicken stock for this recipe? Thanks! Vegetable stock will work great! Hi Lauren! This serves 4-6 people. I’ve updated the recipe! Thanks! Hi! This recipe looks great and will satisfy my need to have something orange at our Thanksgiving dinner. 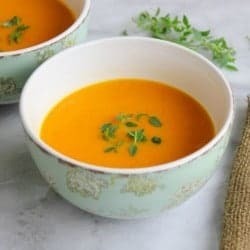 Is it more of a soup consistency or would it go well on a plate with other food items? Thanks!